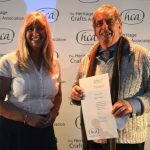 The Heritage Crafts Association set up the prestigious Heritage Crafts Awards in 2012. 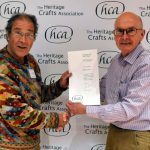 We are indebted to our generous partner organisations for providing funding to allow us to present a unique suite of awards and bursaries specifically for traditional crafts. We are so grateful for this generous support. 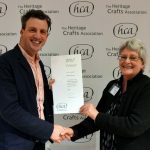 Applications for the Heritage Crafts Awards open in September each year and close usually in mid-November (click here for how to apply). The closing date may differ according to the funders’ schedules. Certificates are presented to the well-deserving winners at the HCA’s Annual Conference each year. The Heritage Crafts Awards celebrate and highlight the traditional living crafts made in the UK that contribute to our national heritage, such as weaving, wood turning, basket making, furniture making and upholstery, shoe making, metal, stone and clay crafts, textile crafts such as weaving, embroidery, knitting and lace making, the lettering crafts, boat building and similar other crafts where there is a significant degree of hand skill at the point of manufacture. The Heritage Crafts Association is a strong advocate in recognising and appreciating these crafts that have been neglected for too long.